What foundation are you using to market your consulting practice? If you don’t know, you aren’t alone. Like an epidemic the number of consultants going about their daily routines without any clear path for their marketing is vast and unfortunately, likely growing. Whitney Keyes has just written a book to help business owners and marketers create a solid foundation for all their marketing endeavours. 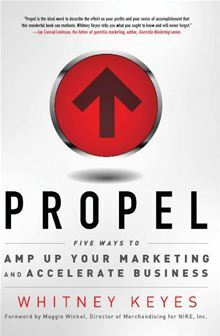 The book, ‘Propel: Five Ways to Amp Up Your Marketing and Accelerate Business‘ and published by Career Press, is Keyes first book yet definitely not her first foray into the marketing world. Keyes managed global marketing campaigns for Microsoft, advised American Express and now consults with business owners and teaches at Seattle University. I read the book in a couple of sittings and must say that I enjoyed the way in which Keyes laid this out. Developed by George T. Doran, a SMART objective ‘forces’ you to go about setting one with the right frame of mind. For an objective to be SMART, it must pass the test:Does it meet these criteria: Specific, Measurable, Assignable, Realistic, and Time-related. This is powerful stuff. Many of us set objectives without confirming that they meet these criteria…and then wonder why things didn’t turn out the way we had hoped. Keyes spent a good amount of time discussing branding – which is valuable for every business to do. The other section I found informative and that I believe will be a great benefit to many is the one on finding your market. Have a very clear understanding of who your real customer is, is critical to your success. The better grasp you have on this the more aligned your positioning will be, and the more effective your marketing will become. Keyes takes the reader through an exercise of how to hone in on your real market and it’s a good process to go through. The sections on the Relationship Cycle and building trust, as well as leveraging existing clients included some great lessons as well. In addition, you will find several stories and examples to illustrate key points throughout the book and Keyes’ tone and style makes this book an easy and enjoyable read. You can learn more about Propel by Whitney Keyes here.